A valuable supplement to learning Cinder's OpenGL wrapper is to study the GL API itself. Listed below are a few resources to help you learn it if you aren't already familiar. 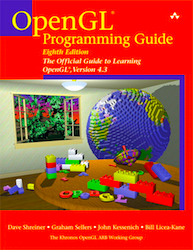 The OpenGL Programming Guide, often referred to as the "Red Book", is the definitive book on the OpenGL API and GLSL. That said, most regard it as a challenging book to start with. Stylistically it's more akin to a reference than a tutorial. However it is comprehensive, and is likely one you'll want to own if you're serious about OpenGL programming. 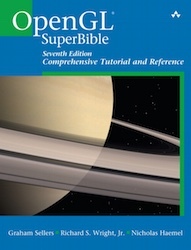 The OpenGL Superbible is written much more as a tutorial or guide as compared to the "Red Book". However it is similarly comprehensive. The most recent edition covers up to OpenGL 4.5. It's well-suited as a very thorough introduction to OpenGL itself. 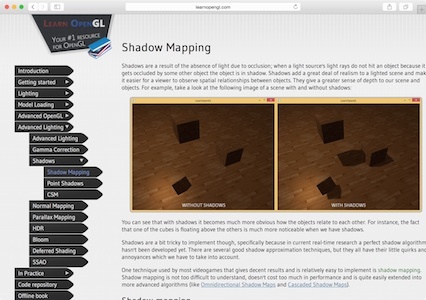 This is an excellent site for starting with OpenGL from scratch. It covers from very introductory topics all the way to advanced topics like Deferred Shading. Liberal usage of accompanying images and code. Strongly recommended.